The USS AUGUSTA (SSN-710), a Los Angeles class submarine, was commissioned on 19 JAN 1985. USS AUGUSTA served her country for 24 years and 23 days, until decommissioned on 11 FEB 2009. 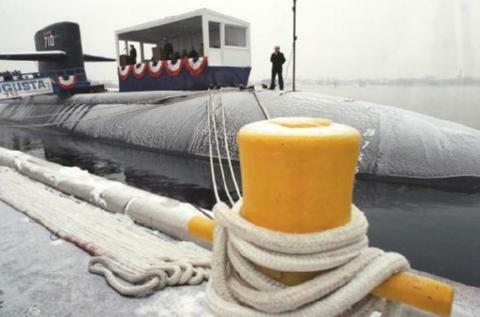 The fifth Augusta (SSN-710) was laid down on 1 April 1982 at Groton, Conn., by the Electric Boat Division of the General Dynamics Corp.; launched on 21 January 1984; sponsored by Mrs. Diana D. Cohen; and commissioned at the Submarine Base, New London, on 15 January 1985, Capt. Thomas W. Turner in command. Augusta carried out shakedown training in the western Atlantic and in the West Indies until mid-June. On the 14th, the nuclear submarine began post-shakedown repairs at the Electric Boat yard where she was built. The availability lasted through the end of 1985 and well into the first month of 1986. She conducted trials at sea between 21 and 24 January 1986 and completed the repair period on the 26th. In February, she voyaged to the Virgin Islands for weapons certifications and technical evaluations. She returned north to New London late in February, but early March found her on her way south again. She carried out further technical work in the Bahamas between early March and the middle of June. During the summer, Augusta participated in midshipmen training cruises and a fleet exercise. The nuclear submarine operated at sea in the northern Atlantic for most of October and then began a restricted availability at Groton on the 31st. Those repairs occupied most of what remained of 1986. Augusta was underway briefly between 15 and 22 December for sea trials; otherwise she remained at Groton. As of the beginning of 1987, the warship was still there.